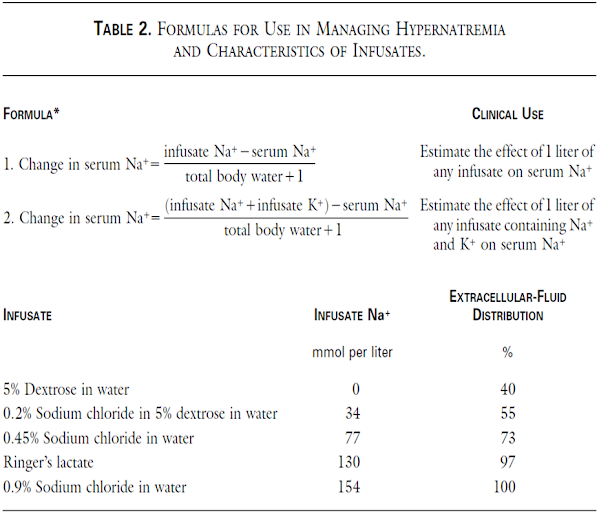 Causes of Hypernatremia *Likely or important ED diagnostic considerations. The cornerstone of treatment is volume repletion. Volume should be replaced first with NS or lactated Ringer's solution. Some practitioners inappropriately fear using NS solution from concern that an [Na+] of 154 mEq/L exceeds normal serum [Na+]. However, in most hypernatremic states, there is a total body [Na+] deficit, and the use of NS allows a more gradual decrease in serum [Na+]. Once perfusion has been established, the solution should be converted to 0.45% saline or another hypotonic solution until the urine output is at least 0.5 mL/kg/h. The reduction in [Na+] should not exceed 10~15 mEq/L per day.